Jack and the Beanstalk comes to life in March. Actually, it's Jack and the Beanstalk, and the Giant, and the Goose, and the Really Truly-Uly Rotten Day, a one hour, interactive musical . 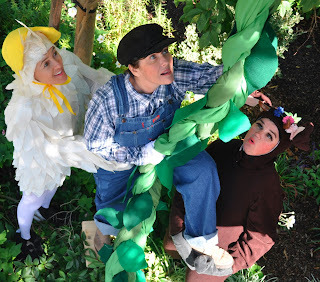 This fractured fairytale version of Jack and the Beanstalk includes singing and dancing, plus comedy and magic. Stay after the show for a meet-and-greet, photo opportunity with the characters. The show is put on by the Masque Unit Junior Theatre of Marin, a non-profit, all-volunteer organization. This is its 54th consecutive year presenting fully produced stage performances retelling classic children's stories. Three performances at 10 a.m., 1 p.m. and 3 p.m.
Tickets: $10 and $12; $10 children (up to 12 years old); $12 adults Get them online here. or call the Marin Center Box Office at (415) 473-6800.